Employers typically use a reference check form to check a job applicant's references. By using a form and standard questions, they are able to collect the same information for every candidate whose references they check. References may be checked in writing. In that case, the form is mailed to the candidate's previous employer. Other times, references may be checked over the phone. Do keep in mind that not all companies choose to provide references. Some may only confirm that you worked there and your dates of employment. 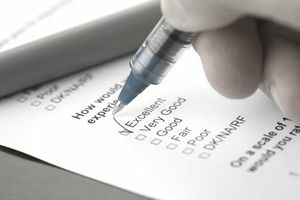 Review a sample reference check form to get an idea of what your previous employers may be asked when they are called regarding a reference check. This sample reference check would be for a phone reference check, filled out by someone from the company you are applying to. Was the applicant an employee of your company? What were the applicant's dates of employment? What was the applicant's salary? Why did the applicant leave? What was the applicant's position and responsibilities? What were the applicant's job responsibilities? How would you rate the applicant's performance? Did the applicant have any performance issues? Did the applicant have any attendance issues? What are the applicant's strengths? Did the applicant get along well with management and co-workers? Was the applicant promoted while with your company? If I describe the position we are hiring for to you, could you describe how good a fit you think the applicant would be for the position? Throughout the job application process, the candidate frames the story. They choose which experiences and skills to list on their resume. When answering interview questions, candidates share stories that paint them in a positive light. By checking references, employers can fact-check a candidate's claims. Has the candidate worked at the jobs they said they worked at, for the dates listed on their resume? Are their skills as described? Checking references also allow employers to get a sense of the candidate's work style, how they interact with others, and how they would fit with the company culture. Checking references is often the last step an employer takes before extending a job offer. Employers can use references to help decide between two promising candidates. A poor reference can make an employer opt against a candidate. In the worst case scenario, it can reveal dishonesty. On the other hand, a reference can reveal that a previous employer does not think highly of a candidate. Even if a reference isn't negative about a candidate, the conversation can reveal aspects of the candidate's work style that make them a poor fit for the job under consideration. References are a significant part of the job application process. Some employers will call several of the most recent positions on a candidate's resume. Here is more information on what employers can share about former employees. If you are concerned about what an employer will say, you can use a reference checking service to check what the company will disclose. When you apply for a job, you may be asked to provide a list of references with your application. Request references only from colleagues and managers who will speak well of you. Always ask references beforehand if they are comfortable serving as a reference. After a person agrees to be a reference, you can share helpful information, such as the job description. If it's been a while since you worked together, you can also remind the person who'll serve as a reference to some of your accomplishments.